Tech changes, but your need to stay connected doesn’t. That’s why we created USB A+C. It’s the perfect way to blend the transition from USB-A charging to cutting-edge USB-C. Our USB-C 18 W can charge the next generation phones and tablets smarter and faster than ever! 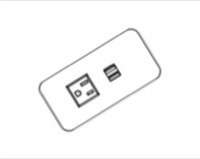 Enhance your tabletop power & data solutions with USB A+C. Nationwide Installation - Our network of professional installers can help you add these modules to your existing conference tables, desk tops, and work surfaces, or we can integrate them with your purchase of new conference room or office configurations. Enhance your work space with easy access to power. data, and USB charging connections. 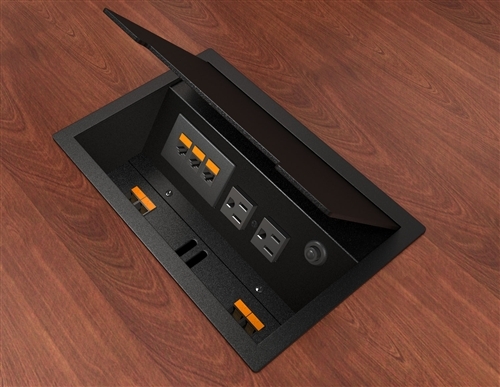 The ACT-CoVe is a versatile power and charging solution designed to seamlessly integrate power, USB charging ports, and data capabilities into a variety of spaces. Available in an array of configurations and flexible mounting options, the ACT-CoVe can easily change any area into a powerful multifunctional space. Ideal applications include collaborative lounge furniture, desks, tables, and soft sided seating. The ACT-CoVe is ETL listed. The ACT Pop-up is an ideal solution for bringing power and data to the tabletop. With a a push of a finger the units pop up to reveal electrical outlets and customizable telecom plates. The Pop-up module provides power and data access to both sides of the table. The ACT Seclude Series with Power and Data is a flexible solution that can easily be mounted to the top or bottom of table surfaces. Newly added configurations with the option for additional data capabilities give users the ability to configure the Seclude modules with all the appropriate data or A/V components to meet their individual project requirements. ACT - Power Data Modules provide easy access to electric outlets, USB charging ports, HDMI, VGA, audio, and data connectivity to your conference table. The PM Series with Power and Data is a flexible solution that can easily be mounted to the top or bottom of table surfaces. Newly added configurations with the option for additional data capabilities give users the ability to configure the PM modules with all the appropriate data or A/V components to meet their individual project requirements. Power Module Connectors and Cables bring video, audio, and data to your conference room, training center, and classroom tables. 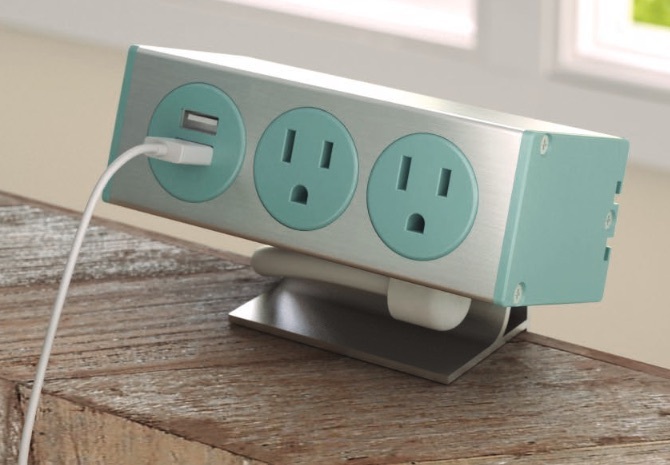 The PM-DOT Series with Power and USB Charging connections is a flexible solution that can easily be mounted to the surface or edge of your table surfaces. Newly added configurations with the option for additional USB-A or USB-C capabilities give users the ability to configure the PM-DOT modules with all the appropriate components to meet their individual project requirements. 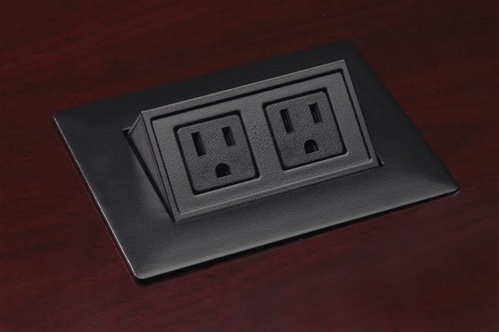 PMAZ Series - Power Data Modules provide easy access to electric outlets, USB charging ports, and data connectivity to your work surface. PMB Series - Power Data Modules provide easy access to electric outlets, USB charging ports, HDMI, VGA, audio, and data connectivity to your desk or conference table. When it comes to looks, PMB Series is long on possibilities. The removable top surface can be customized with an endless range of materials or graphics, while its remaining sides boast a sleek, high-gloss Black or White plastic finish. PME Series - Power Data Modules provide easy access to electric outlets, USB charging ports, HDMI, VGA, audio, and data connectivity to your conference table. 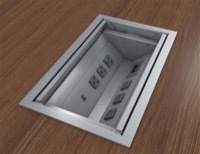 In a world where power, data, USB, and video connections are key, why are you still climbing under conference room tables to plug in your computer, smart phone, pad or tablet? VQV is here to help make connecting - in all its electrical and digital forms - a little easier... and certainly less clumsy. PME2X Series - Dual-sided Power Data Modules provide easy access to electric outlets, USB charging ports, HDMI, VGA, audio, and data connectivity to your conference table. PMG Series - Power Data Modules provide easy access to electric outlets and data connectivity to your work surface. PMHO - Power Data Modules provide easy access to electric outlets, USB charging ports, HDMI, VGA, audio, and data connectivity to your conference table. PMR Series is a retractable solution to desktop power and data needs. These convenience outlets bring new flexibility to the table, because they don't require cutouts to work surfaces. These power and data centers attach to the underside of a conference table, desk, or work surface. PMS2 - The next big idea might come from across the table, so all those around the table should have the access to power up and participate in the meeting. PMS2A is a side-by-side power / data module for conference tables. This unit provides access to power and data from both sides of the meeting table. And with PMS2A, power and data is also concealable thanks to its one-touch access design. PM2X, PM3X, PM4X - Power Data Modules provide easy access to electric outlets, USB charging ports, HDMI, VGA, audio, and data connectivity to your conference table. PMAX provides freestanding desktop power that allows you to easily plug in laptops, phones and more„without fishing under the table. Modern lines, smooth anodized aluminum construction and our stylish braided cord options make it a stand out that can easily blend in when needed. It is available in 2, 3, or 4 port sizes with a range of power and data, including the new future-focused USB-C charging port. The ACT-PI Quick Kits seamlessly bring power to height adjustable worksurfaces. The ACT-PI provides power, USB charging, cord management, and our new 8 wire, 4 circuit QuikLink, Plug and Play electrical system which allows multiple units to be linked together from one power infeed. Our unique “No Particular Order” feature allows furniture to be reconfigured in any space without the need to follow any particular order or sequence. ACT-PI Quick Kits provide all necessary components for popular table sizes making specifying simple. TACT - TACT Telecom Plates bring video, audio, USB Charging, and data connectivity to your conference room, training center, and classroom tables. 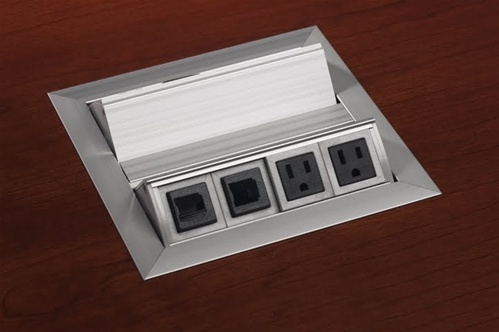 Video Share Switch - Power Data Modules provide easy access to electric outlets, USB charging ports, HDMI, VGA, audio, and data connectivity to your conference table. The PMHQ is the central hub where all of your technology can come together to recharge - whichever way you connect. It includes USB access for your tablet, power outlet for your laptop, even wireless - simply set any Qi-friendly device on the surface, and you’re charging. Sometimes, the best surprises are found just below the surface. Our compact PM-BoHo delivers a surprising amount of power with an unexpected twist—its cool, multi-directional hinge is able to open from either side, for easy access wherever you’re sitting. Choose from 110 power, USB, USB-C, or data with two windows on each slope, four plug-ins total. The innovative lid design can even be closed while in use, for a clean, modern look. The ACT IV is the newest edition to our Tabletop family of power and data units. It is designed to fit into the same footprint as the ACT, however, its power capabilities have doubled to include four power. The ACT I TT is the newest edition to our Tabletop family of power and data units. It has 4 power receptacles, 15 AMP circuit breaker and cutouts for 4 Telecom Plates.. The ACT II TT is the newest edition to our Tabletop family of power and data units. This double-sided unit has 8 power receptacles, 15 AMP circuit breaker and cutouts for 8 Telecom Plates. The ACT G2 is a simple solution ideal for small conference areas and meeting rooms. It seamlessly replaces the popular Interact series with the addition of new and improved features. ACT G2 provides power, data and USB charging accessible at the table top with an additional convenience outlet located underneath for added utility power. The Interface G2 is an ideal solution for large conference tables and meeting spaces. It seamlessly replaces the Interface Series with new and improved features that fit the same cutout size. Packed with four power and three telecom plate cutouts, the Interface G2 is available in configurations both with and without USB to satisfy all your connectivity needs. The ACT IV G2 is the newest edition to our Tabletop family of power and data units. It is designed to fit into the same footprint as the ACT, however, its power capabilities have doubled to include four power. Save up to 70% on your purchase of select Power Modules with USB Charging, Data and Video Connections. As an added benefit we offer FREE SHIPPING on all the Power / Data Modules we sell. PMX Series - Designed for high density conference room areas. Optional voice, data, video, audio, and USB charging ports can be added. PMHO2 Series - Retractable design for easy cable management. Optional voice, data, video, audio, and USB charging ports can be added. PME Series - Keep clutter out of sight by allowing use while lid is shut. Optional voice, data, video, audio, and USB charging ports can be added. PMHO Series - Power Data Modules - The one touch pop up door remains open during use. Optional voice, data, video, audio, and USB charging ports can be added. ACT CoVe Series - Power Data Modules - Flat surface for easy access to power, and USB charging. Optional voice, data, video, and audio ports can be added. ACT Series - Convenient access to power outlets. Optional voice, data, video, audio telecom ports can be added for customized use. PME2X Series - Power Data Modules - Dual-sided power and data module. Optional voice, data, video, audio, and USB charging ports can be added. PMY Series - A range of power, data and USB configurations are available. PMG Series - Constructed in durable die-cast zinc. Optional voice, data, video, audio, and USB charging ports can be added to this power module. Work Surface - Modular units attach to a surface via an edge clamp or surface mount hole. Optional voice, data, video, audio, and USB charging ports can be added.